Question: What is the height of the overhead door? Answer: Thank you for your inquiry. The door size is 9x7. Question: i am building a shop, can the plan be built with a provided wooden floor plan? 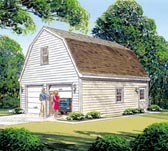 Answer: This plan is drawn on a slab foundation. 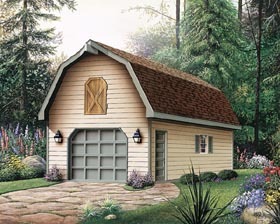 Question: Can an apartment be made out of the upper portion of the garage? Or is it designed to just be a loft? Answer: Yes, it could be made into a small apartment with some plan modifications but keep in mind that the ceiling will be sloped and the ceiling height before it is finished is 6’-7”. Loft area 10'1" accross with Height of 6'-7"